News from LMCU: We’re updating our Mobile App! We’re updating our Mobile App! You’ll be able to deposit checks into your LMCU account, from all Android and iPhone devices, as well as third generation iPads. Just endorse the check, capture a photograph of it right from your smartphone, send it, and you’re done! 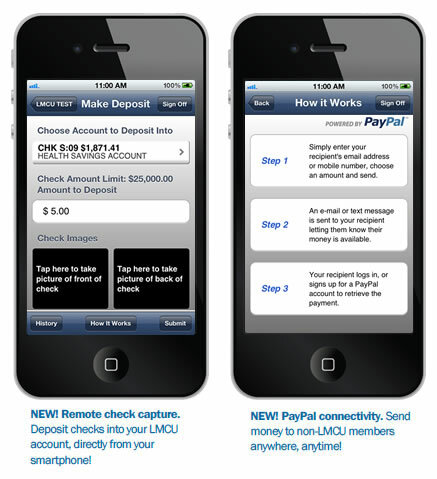 You’ll be able to send money to non-LMCU members directly through PayPal. * It’s a great way to pay the babysitter, or cover your share of the dinner tab. If you already have the app, this new upgrade will be available automatically. If not, you can download LMCU Mobile through the Apple Store and the Android Market. *A surcharge of one dollar ($1) per transaction applies.